Calling all chocoholics out there...me being one! Get ready for a guilt free National Chocolate Week - 10th to 16th October. This year, the lovely people at Montagne Jeunesse have satisfied every chocoholics dream with their new luxurious Hot Chocolate Orange Self Warming Face Masque. Just one whiff is enough to lift your mood and release feel good endorphins into your system! The mask is perfect for normal, oily and combination skin so you can indulge to your heart’s content with this chocolate delight guilt-free without worrying about your waistline! All their products are paraben free, are suitable for vegetarians and they don't test on animals. I firstly cleansed my face then with a slightly damp skin I applied the masque evenly over my face and neck, avoiding the eyes and lip area. I left the masque on and relaxed with a hot chocolate - well it is chocolate week ;) I experienced an instant warming effect, which is relaxing rather than being uncomfortable, and it smelt good enough to eat! After 15 mins I rinsed the masque off using warm water, which I have to say was quite messy to remove due to it being like melted chocolate. I enjoyed this self warming mask and afterwards my skin felt refreshed and my pores felt like they had a deep clean, looked less noticeable and some blackheads had been removed. Although they recommend using this mask twice a week, I would probably only use a mask like this when I break out or around my nose area where I suffer with blackheads as my skin tends to be more on the dry/combination side. 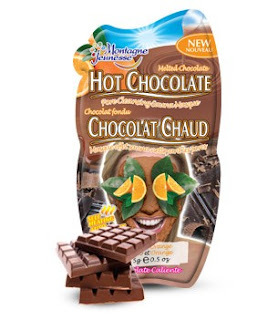 The new Hot Chocolate Orange Self Warming Face Mask costs £1.09 so great for those wanting a guilt free treat on a budget and is available from www.montagnejeunesse.com - the fudge Sauna Self Heating mask sounds gorgeous too! Are you a fan of Montagne Jeunesse masks? What are your favourites? That sounds awesome. I can't wait for it's release in NZ! I've seen their other products but this one is a MUST HAVE.